Meeting planners are consistently challenged to find corporate team building activities that are new, interesting, and effective. And that’s exactly where horses come in! Equine-assisted team building activities can foster critical thinking, help people re-engage with their co-workers, and define or reinforce their place in the larger corporate culture. 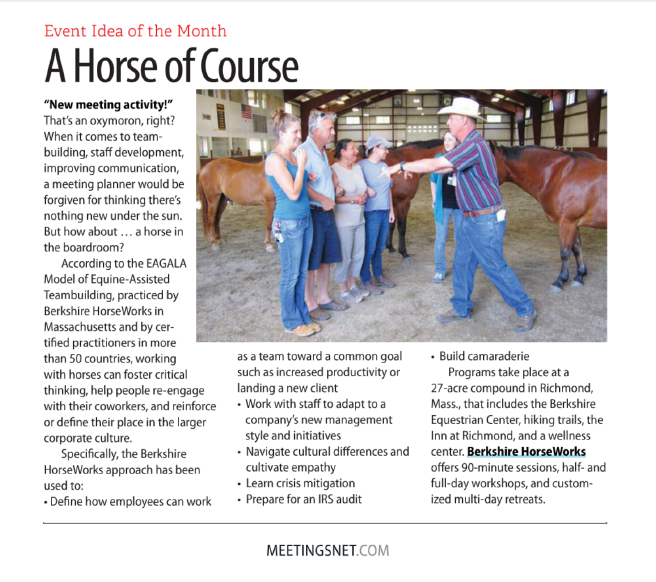 Berkshire HorseWorks offers corporate team building activities in sessions of 90 minutes, half-day or full-day workshops, and customized multi-day retreats. For more information contact Hayley Sumner at (310)488-9777. See image of the original article below. Click link for a printable PDF document of the actual article that appeared in Meetings Net.